However, closeness to the customer remains a fundamental principle at ERGO and continues to be based on the presence on the ground. To reduce the impact on the environment of our business travel, we further expanded our infrastructure of video and web conferencing at the German locations. CO2-neutralrail journeys, our very own car sharing agency within the Company, an airport shuttle and specific training initiatives nevertheless contribute effectively to the reduction of environmental pollution within Germany. This is also achieved by the car-fleet regulations updated in 2012, which define fuel-efficient vehicle classes with maximum CO2 emissions for all levels within the Company including the Board of Management. This system also commits all users of company cars to undergoing a training course in ecodriving. Measurements after the training reveal average fuel consumption that is ten percent lower. In 2013, we brought down our overall fuel consumption in Germany by 14.3 percent per 100 kilometres compared with the previous year. Outside Germany, DAS in the United Kingdom achieved further progress in implementing an environmentally based business travel concept. Our subsidiary company was granted the highest distinction in the “West of England Travel Awards” for its achievement in 2012 for the fourth time. Our employees receive training which gives them information on alternative ways to get around; for instance, they are urged to take the train rather than flying for short and medium distances. 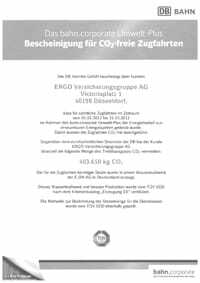 In July 2011, ERGO switched to using “green” train tickets for journeys within Germany, making all our business journeys undertaken by train carbon-neutral. We also help cut costs and reduce the environmental impact of fuel and electricity consumption by putting appointments or meetings in the same location back-to-back and, wherever possible, using tele- or videoconferencing rather than travelling to meetings. Employees can find detailed information on carrying out these options in the Company intranet, where we put them in the know on the technical requirements for video and web conferencing and point them towards useful software training units. At our Düsseldorf offices, we have set up two new conference centres which have the technology to include external participants. A twin advantage – in this case lower costs and less CO2 - is also provided by the airport shuttle introduced in October 2013. It is available to employees of the Düsseldorf ERGO headquarter three times on every working day. We also have our very own lift-sharing agency which also plays a part in cutting energy consumption and costs. When people share lifts, there is less traffic on the roads, the environmental impact of car travel is limited and it costs less too. It's easy for employees to organise lifts and carpooling in the intranet: They can add offers or requests under the correct heading on the appropriate page. In addition to all this, our ERGO Intranetgives car users a range of general tips on fuel-saving ways of driving. One example: when waiting at traffic lights, switching off the engine saves fuel after just 25 seconds. Getting on your bike has a host of benefits, for the planet, your bank balance and your health. ERGO supports its cycling employees with a whole series of initiatives. One of the most popular is our solar-powered air-pump station, to be found at our Düsseldorf, Cologne and Hamburg sites, where employees and members of the public can pump up their bike tyres quickly and easily. We are planning to install more stations step by step as a further sign of our commitment to protecting our environment.